The Canadian Clay and Glass Gallery, located in UpTown Waterloo, is dedicated to exhibiting and collecting ceramic, glass, enamel and stained glass works of art. Featuring newly renovated gallery spaces, it is a popular destination for art enthusiasts of all ages. Local and international visitors will find contemporary artwork from both emerging and established artists. Featuring exhibitions that rotate four times a year, there’s always something new to discover. The Canadian Clay and Glass Gallery is also dedicated to arts education, and offers many programs that both develop arts appreciation, and allow for hands on creativity. Their educational programs include regular ongoing school and after-school programs, spring and summer art camps, teen- and family-focused events, youth public art projects, and adult workshops for both the beginner and experienced artist. Waterloo was chosen as the site of Canada’s permanent home for the country’s finest ceramic pieces during the Ceramists Canada Annual General Meeting in 1982. The Glass Art Association of Canada and Artists in Stained Glass also joined the discussions and the gallery concept evolved to include glass, stained glass, and enamel works. The Canadian Clay and Glass Gallery opened its doors in June of 1993, and now welcomes over 20,000 visitors each year. Admission to the gallery is free. Visit the Gallery Shop to find handmade, one-of-a-kind pieces by more than 150 artists from across Canada. From jewellery and home décor, to wall hangings and sculptures, the Gallery Shop has something for every taste and budget. 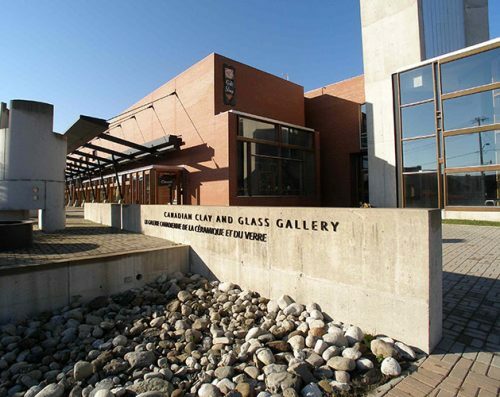 The Canadian Clay and Glass Gallery is also a popular venue for hosting corporate, community and private events. With its award winning architecture and wide variety of spaces available, the Gallery provides a unique space for small and large events. Open year round, the shops in St. Jacobs feature unique items including clothing, décor, jewelry, and original crafts. Enjoy a meal or grab a snack at one of the village’s restaurants or cafes. Learn about the village’s Old Order Mennonite population at The Mennonite Story interpretive centre. Enjoy world class golf any day, regardless of the weather, at Golfplay in Kitchener.The golf simulators used at Golfplay are by Golfzon. Choose from the indoor practice range, on course practice, challenge mode, or play one of the more than 130 courses from around the world.